One thing I love about guiding is you get to meet people from all over the world. Matt came from Austria to go swing some flies on the Salmon River. 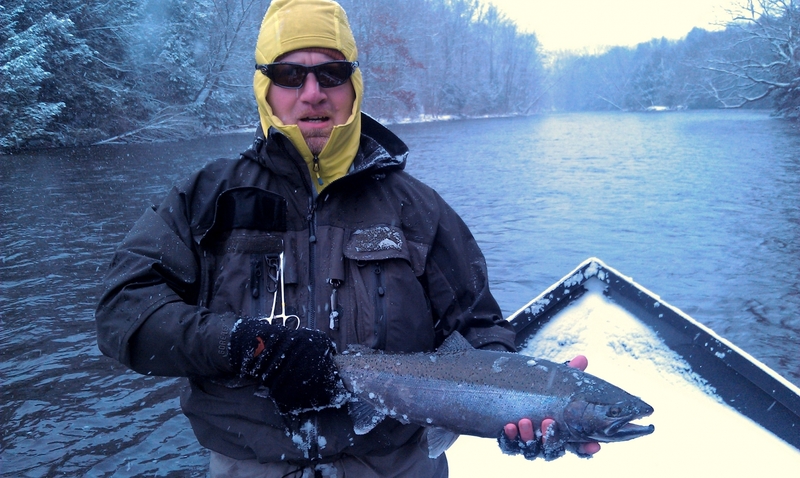 The weather was brutal, single digits, snowing sideways most of the day, just typical Great Lakes winter steelhead fishing. Also not the best weather to be trying to tempt a steelhead to chase down a swung fly. After a couple of very light plucks this steelhead hit on the strip in, pretty cool grab to say the least. Matt an I shared and compared fishing stories and talked about trout fishing over there and the cost. Most trout streams are private and you need to belong to a club to fish them for a pretty penny. A reminder not to take for granted what we have here in New York. Check out the New Simms G3 Bootfoot waders. These are the end to cold feet while fishing in the winter. I finally got mine the other day and can’t wait to try them out.